Running clubmoss at fruiting (left, with narrow pointed cones) and non-fruiting stages. Photos by Teegan Bennington (right) and Kelly Fretwell. Clubmosses are vascular plants that reproduce by spores (like mosses and lichens) rather than seeds (like most other vascular plants). Ferns and horsetails share these characteristics. Running clubmoss is an evergreen perennial with horizontal creeping stems that grow to over a meter long. Upright stems branch off the main stem. These upright stems grow to 25 cm tall, are irregularly branched, and bear 2-4 yellowish, pointed cones on long, scaly stalks. Running clubmoss stems bear numerous bright green leaves. These leaves are small and crowded, and are often tipped with long white hairs. 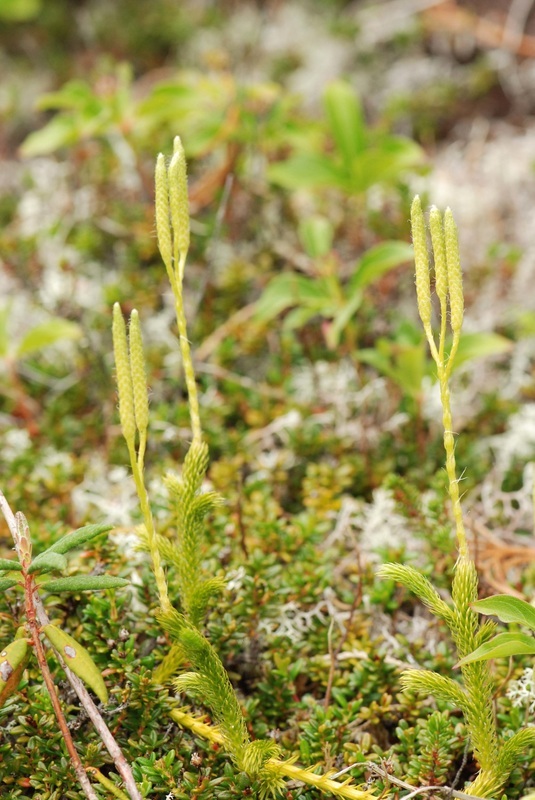 Running clubmoss grows on dry to moist soil in openings and clearings, open forests, and around swamps and bogs. It grows at low to subalpine elevations and occasionally in alpine habitats. It is a common species throughout most of BC, and its west coast range stretches from Alaska to California. It is a widespread species across most of North America and the rest of the world - it is also found along the east coast of North America, across most of central Canada and the northern United States, and in parts of Europe, Asia, Africa, and South America. Click here to see a North America range map. 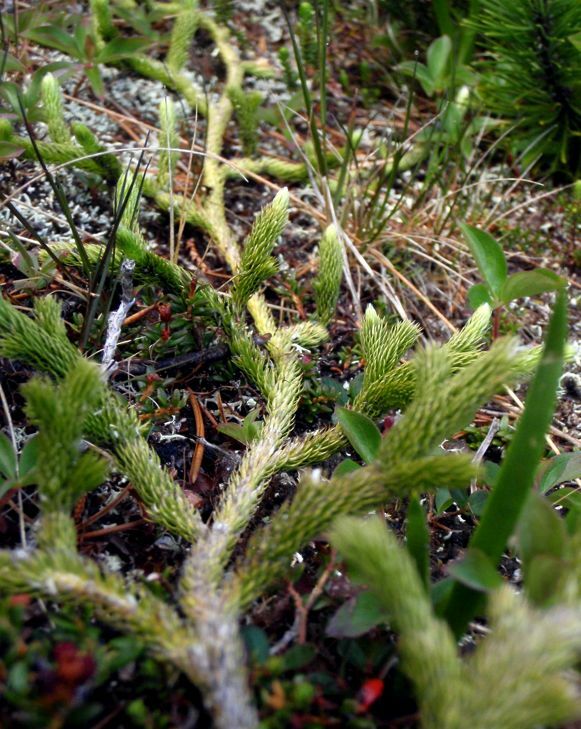 Stiff clubmoss is a similar species found on the BC coast. Each of its upright stems bears one stalkless cone, whereas running clubmoss stems bear multiple cones on a long stalk. Running clubmoss is sometimes used as a Christmas decoration. Lycopodium clavatum L. In Klinkenberg, Brian. (Ed.). E-Flora BC: Electronic Atlas of the Plants of British Columbia. Lab for Advanced Spatial Analysis, Department of Geography, University of British Columbia, Vancouver. Accessed 03/09/2013. Pojar, J. and MacKinnon, A. (1994). Plants of Coastal British Columbia. Vancouver, BC: Lone Pine Publishing. P. 432.